Missing rugby this summer? Or Want to try out rugby for the first time? Kick of is at noon. Pay attention to email for more information on travel plans! We will also be hosting a team info meeting on June 14th. 6 PM at the Corner Brewery in Ypsilanti. Practice starts outside on Tuesday April 3rd. Team meeting will be announced soon! Game 1 of the Spring Season is this coming Saturday, May 5th. Kickoff is at 1 PM so be sure to arrive 1.5 hours early to get ready. Mo is in charge of the field so please help her get it ready for the match! Check your inbox for more details on the game and how you can help. The social will follow the match at Riverside Park. Good luck ladies! Next Tuesday, practice will be moved to 5555 Thomas Rd. Ann Arbor 48108 (Frech Farm). The college women are having a scrum practice so we will be joining in for some of the fun and then doing a bit on our own. Same time as usual 6 PM. Tuesdays and Thursdays 6-8PM @ Riverside Park Ann Arbor. Be booted up and ready to go by 6 if at all possible! 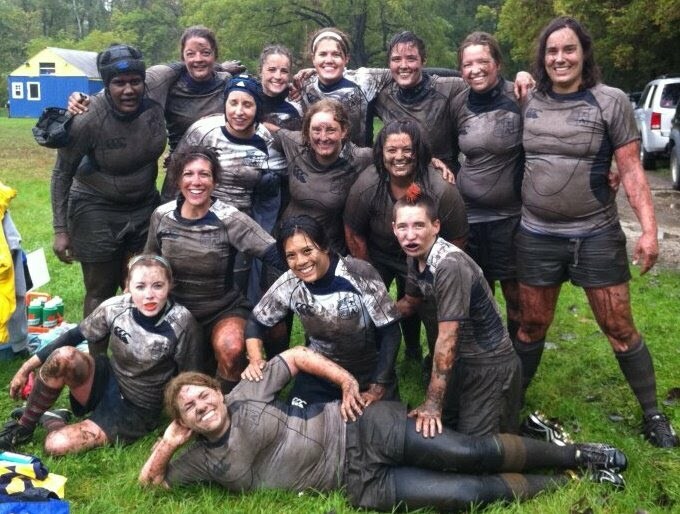 Muddy, muddy, cold and happy–the AAWRFC managed to swim their way to a score and a few good runs, but not a win. This was a whole team effort and we had a blast trying to get to the try line–the hard part was finding the ball. on a great defensive effort on the wings. Strong and dirty work all around ladies and let’s get that W this weekend!